Someone once gave me some very sage advice. “The things you have to work hard for are the best“. At the time I wasn’t very impressed with this, but actually it’s true, for me at least. Frequently I have to work hard* to attend things and today I dragged the family out early on a long promised outing, so I could make it home in time to get organised to go to a reading at Dead Soul Books. These events always remind me how small Dunedin is and how good this can be. I turned up on my own not really expecting to know anyone except Dean Havard:- proprietor of Dead Souls books and also the man behind Kilmog Press. But as people arrived, it seemed like I knew nearly everyone. And the readers: Former Burns fellow, David Eggleton ; current Burns fellow David Howard; Lynley Edmeades, poet and one of the people behind Deep South. Dunedin is rich in the arts. The event was a launch for Vaughan Rapatahana’s books Toa and China as Kafka (a Kilmog Press book). 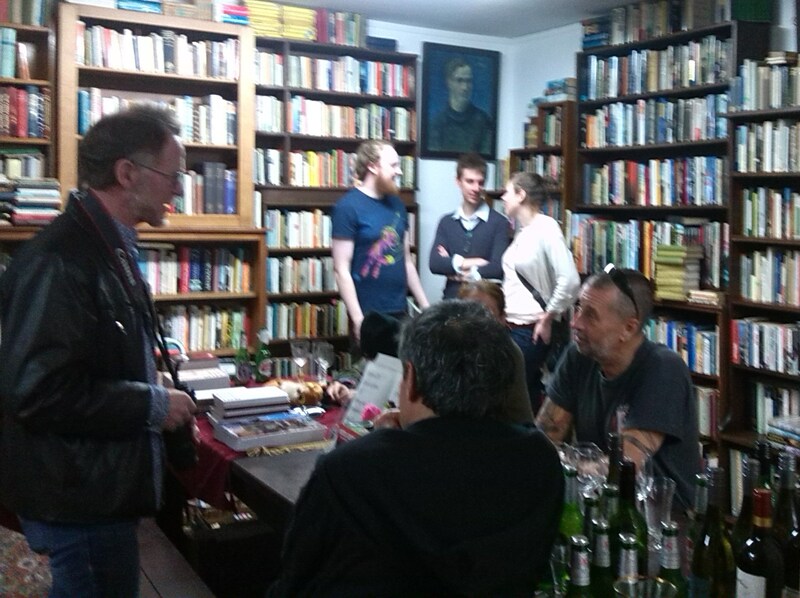 The setting was brilliant (Dead Souls is an atmospheric, old world bookshop), and the readings very good. I am sometimes wary of poetry, in fact I told someone at Dead Souls today that poetry makes me feel out of my depth. But I am a reader and consumer of poems. What I like is when a poem speaks to me, whispers in my ear, stays with me long after. Some times they reach out and grabs at me and today’s poems did that; Vaughan’s readings especially so. A poem from China as Kafka ‘At Waikanae’ described as “a lovely, lyrical poem reminiscing about the teenaged poet and his cousin mowing the lawns at their urupa, tending the graves of their whanaunga. ” But it spoke to me of living and working on the Kapiti Coast, of the tangi and the urupa I encountered and the sadness. I felt homesick. Rapatahana also read from his novel Toa “a road trip through the ‘skinny country’ where Mahon, an ex-university philosophy lecturer, and his gun ‘Molly’ blast their way across the country in a black Mark IV.” Now that’s a book you have to read – and I’m looking forward to reading my copy. I often think of tribes (in a postmodern sense) as I move through life and especially at events like this. I’ve never quite found my tribe. There has always been a disconnect. Occasionally, like today I find myself on the edge of a group and think, “maybe this?” But mainly I think I live at the intersection of many – in that slim crossover area of a Venn diagram; a lost soul perhaps? But did today’s poetry stay with me? Yes. Humming on the drive home and then while I cleaned out the rabbit hutch and I noticed how sweet the new hay smelled. It followed me to the supermarket and then while I folded the washing. And now while I write this…and that is all good. * It may not sound like work, but for me a trip to the public pools is like entering one of the seven circles of hell. I don’t do poetry much either, but every now and then, a phrase or an image grabs me, and I see it everywhere. Also, exactly so w.r.t. public pools. Or indeed pools in general. Those moments where we smell the sweet hay are so very satisfying and good. Thank you for sharing, friend. Ahhh … thank you Pauline – I was sad I couldn’t make it to the reading, but reading your account has taken me there anyway. I am enjoying your spate of blogging – you have a natural easy writing style that is immediately accessible – readable and thought-provoking at the same time. Intelligent and perceptive. Lots of “Yes, that is so true” moments. Thank you so much Kay!